Missing teeth have a negative impact on many aspects of a person’s daily life like the confidence they have when performing everyday tasks and how they showcase themselves to others. At Hackettstown Oral Surgery, we provide dental implants to restore oral health and dental function for those who have lost one or more teeth. Our oral surgeons, Drs. Steven Bogart and Hubert Gugala, have the skills and expertise to create a successful treatment plan to achieve desirable results. Looking to know more about this restorative procedure? Contact our Hackettstown dental practice today! Our team of experienced dental professionals makes every effort to ensure we achieve the best outcome for our patients. What goes into implant treatment? The dental implant process consists of four segments: consultation, implantation, healing, and the restoration. The first three sections of treatment are addressed at our surgical facility. A dental implant is also made up of three components: the implant post, the abutment, and the prosthetic. The post is what is placed into the jawbone, to provide stable support to the restoration. 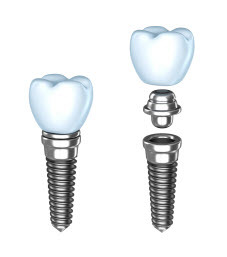 The abutment is what connects the bottom and top section of the implant. When patients have lost one or more of their teeth, they do not just lose the visual aspects of the smile, but they suffer the loss of the tooth root. The roots of teeth are what keep the jaw healthy, as the bone does not go through a process known resorption. This is where the adjacent bone is used to fill in the empty spaces, which can weaken the bite and cause a person to appear prematurely aged. Before beginning the implant procedure, our doctors provide you with preoperatory instructions and information on what to expect during and after the surgery. To ensure the implant process goes smoothly, patients are prescribed a method of sedation to eliminate discomfort and increase one’s ability to relax. For the best accuracy in the placement of your dental implants, we use surgical guides, which minimizes the risk for error. Our oral surgeons also compose a digital model of a patient’s dental anatomy utilizing a CT scan, to better explain the procedure and show results to patients. We only give our patients top-quality dental implants, ensuring they integrate with surrounding jawbone to provide optimal support. To receive your restoration, which would happen at the completion of your implant treatment, you are sent back to the trusted office of your regular dentist. For more information on this restorative procedure, contact Hackettstown Oral Surgery today! Our oral surgeons, Drs. Bogart and Gugala, do what they can to make sure patients are comfortable and confident with their treatment plan. A dental strategy that meets their needs and goals on the way to improved oral health and aesthetic.